Although taking up golf later than many of the games greats, Norman amassed 91 professional victories around the world and reigned atop the Official World Golf Rankings for an astounding 331 consecutive weeks. The dynamic and charismatic Aussie with his shock of blonde hair earned the nickname The Great White Shark for his aggressive, attacking style of play, and he later named his company Great White Shark Enterprises. Gregory John Norman was born on February 10, 1955, in Mount Isa, Queensland, Australia. He played rugby and Australian Rules football while growing up, but became hooked on golf at age 15 after serving as a caddie for his mother Toini. His first golf instruction came through Jack Nicklaus best-selling book, Golf My Way. Within a couple of years he was playing to a scratch handicap, and after participating in a series of amateur events, he turned pro in 1976 at age 21. He earned $28 a week as an assistant professional at Royal Queensland Golf Club, a far cry from when he later became the first golfer to surpass $10 million in career earnings on the PGA TOUR. Norman began competing on the PGA TOUR full time in 1983 and won the Kemper Open and the Canadian Open the following year. He became one of the most dominant players in the world in the 1980s and early 90s and was consistently at the top of the leaderboard in the major championships. In 1986, Norman assembled one of the great seasons in golf history. He won 10 times worldwide and led both the PGA TOUR and the Australasian Tour money lists. Most significantly, he held the 54-hole lead in each of the four major championships, and he broke through for his first major title that year by winning the Open Championship at Turnberry, in Scotland. He captured a second Claret Jug in 1993 at Royal St. Georges thanks to a sterling final-round 64. The Great White Shark led the PGA TOUR in earnings three times (1986, '90, '95) and scoring average three times (1986, '89 and '94), and in 1995 he won the Jack Nicklaus Trophy as PGA TOUR Player of the Year. Norman is widely considered one of the best drivers of the golf ball in the game, and he was inducted into the World Golf Hall of Fame in 2001 with a higher percentage of votes (82%) than any other inductee in history. Off the course, Norman embarked a successful business career, establishing his Greg Norman Golf Course Design company in 1987. He expanded into other business avenues even as he maintained his full-time touring schedule. 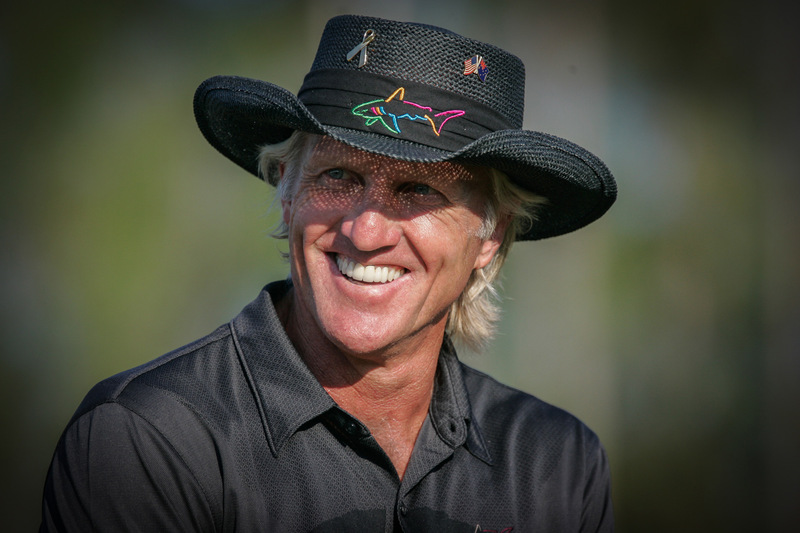 He founded the Greg Norman Collection clothing line in 1992 and made his foray into the wine industry with the formation of his umbrella multinational corporation, Great White Shark Enterprises. His philanthropic efforts have raised more than $12 million for charities, including CureSearch for Children's Cancer, which is supported by a tournament he hosts, the Franklin Templeton Shootout, and the Environmental Institute for Golf promoting sustainability and environmental responsibility.